Austin, Texas – Recently Stage CMDR was called upon to cover an Olympic size lap pool. To cover this pool, it required over 100 plus “Commander Decks”. The design concept was to have the center portion clear using “Commander Plexi Decks” and the surrounding edges used the standard black “Commander Decks”. In addition to that, “Commander Grated Decks” were placed symmetrically to allow ventilation to air out from the heated pool being covered for over a week. Lap pools are heated to a specific temperature year round. This special event was for a tech company celebrating its wrap on a large scale project. 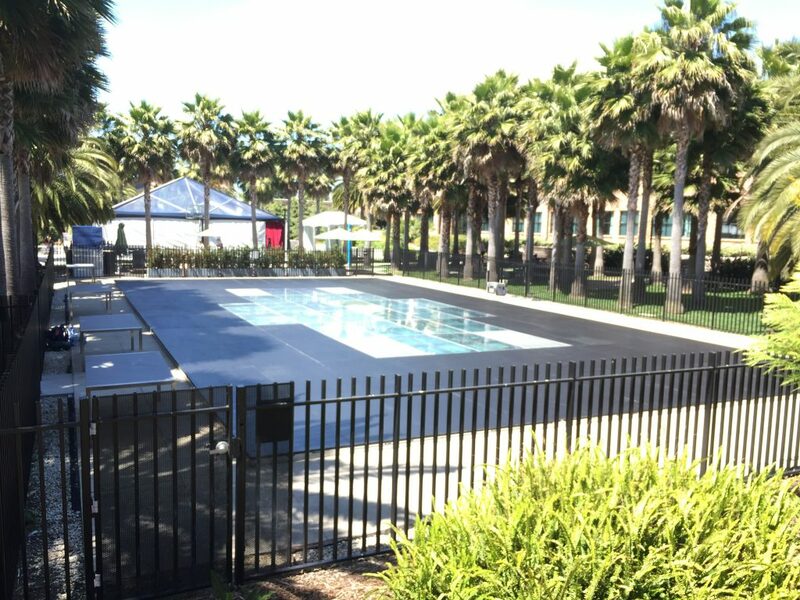 They needed the pool covered to transform the area into one large bar that will serve the 2500 guests in attendance. Stage CMDR was chosen specifically for this project because of its past pool cover portfolio, company safety rating, equipment quality and time of execution of the project.